The sun was blazing in the sky when I woke up on Thursday morning. The forecast was about 24º but it felt waaaay hotter than that. I headed to Starbucks to get my coffee fix and wrote my blog (I’d got a bit behind!) 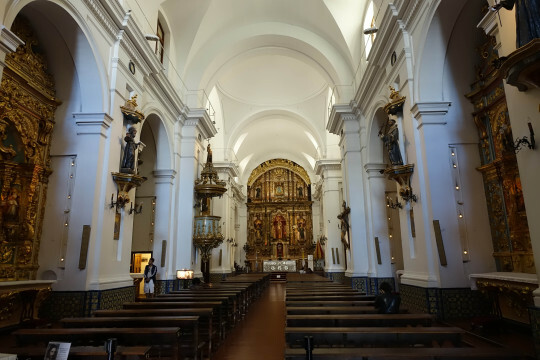 before heading out to explore the Recoleta area of Buenos Aires. 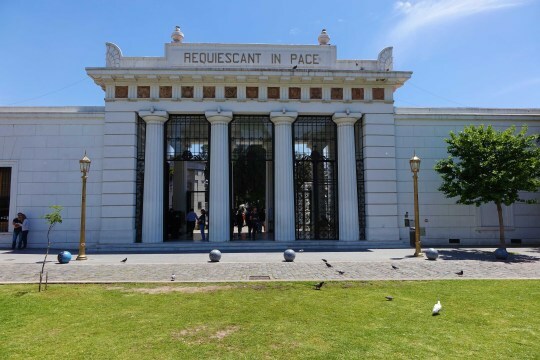 I’d read Recoleta and Palermo were the best neighbourhoods to visit if you only had a short time in the city, so I thought I’d spend a day in each. 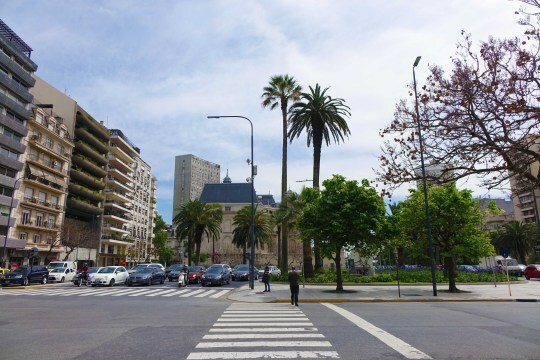 Buenos Aires’ wide avenues are pretty amazing – they’re really long and very wide – enough for about seventeen lanes of traffic! Can’t really imagine that in London. After walking for about 25 minutes through Recoleta’s leafy well-to-do streets and seeing lots of dog walkers (one with about ten dogs!) 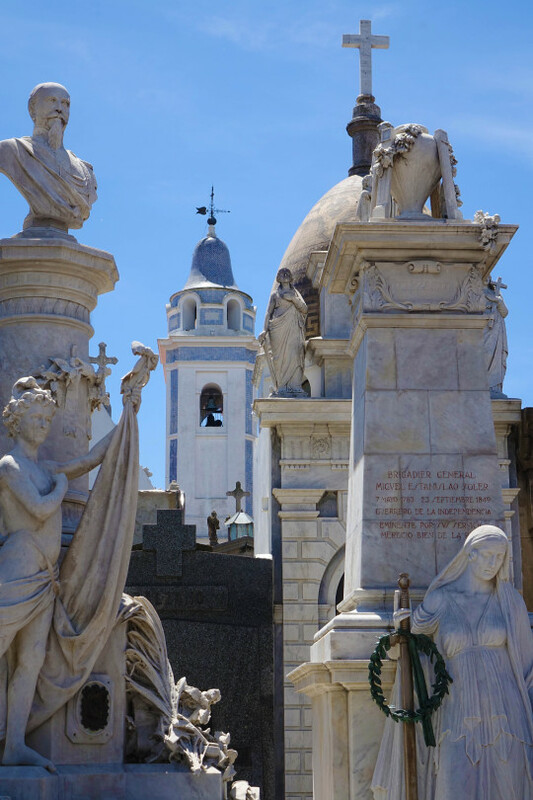 I arrived at the first stop of the day – Cementerio de la Recoleta – or Recoleta Cemetery. It’s the city’s top sight, which is pretty weird when you think about it. The entrance looked impressive. 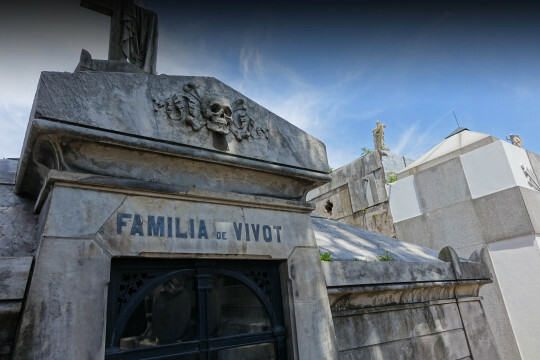 The cemetery’s been named as one of the top five in the world apparently, and was created in 1822. 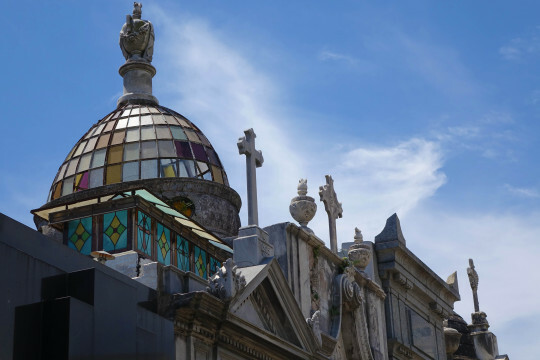 It’s jam-packed with fancy and ornate mausoleums and is really peaceful and quiet. The cemetery offers tours in English at 11am on Tuesdays and Thursdays, and I arrived just in time. That’s our guide below. 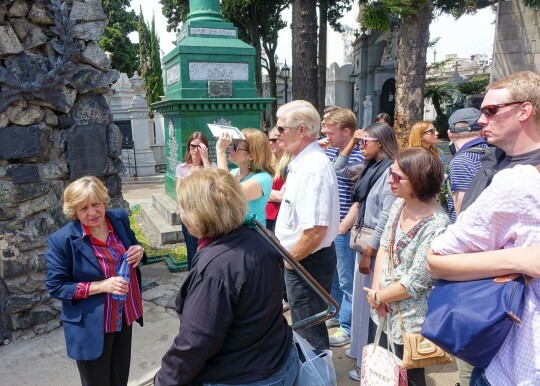 There were loads of tourists in the cemetery and school groups milling around – a lot of Argentina’s history can be found here. 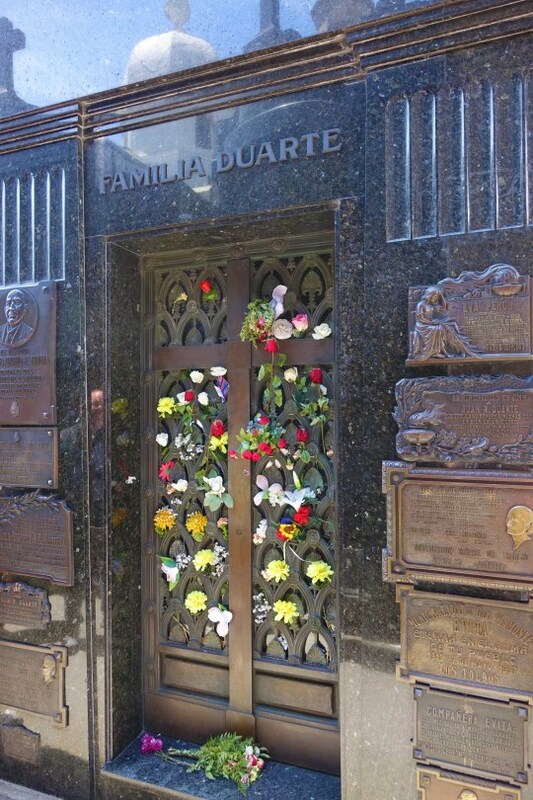 The tour lady took us around and explained where important people in Argentina’s past were buried, who they were and where they came from. She also explained how the cemetery came into being. 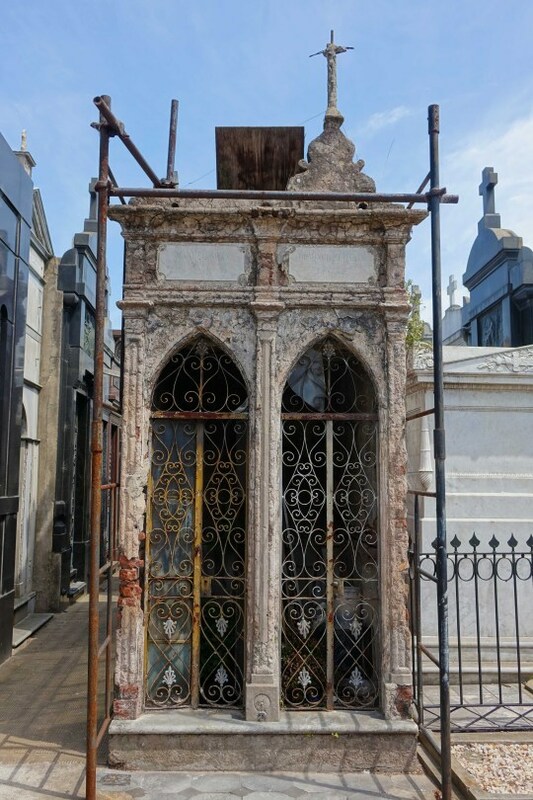 While some mausoleums were well looked after…. Others had fallen into disrepair – she explained that a lot of younger family members no longer care about the state of their relatives tombs. There were also some really brand new modern looking ones – it was a real hotchpotch of different styles. 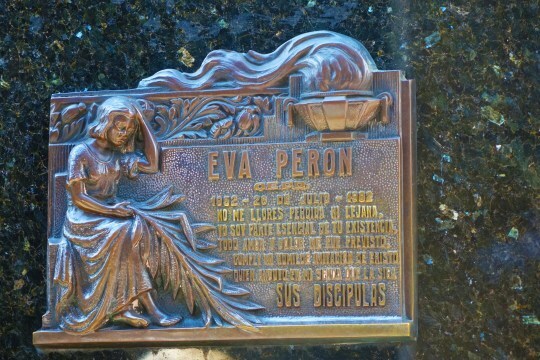 Probably the most famous person buried here is Eva Peron – I’d be finding out more about her on Friday, but there was a big queue to see her tomb. People come and place flowers there every day. Two American tourists took selfies here – not sure what the selfie etiquette at a grave is?! As we walked around, our guide told us that there can be around 18 people buried in any mausoleum. 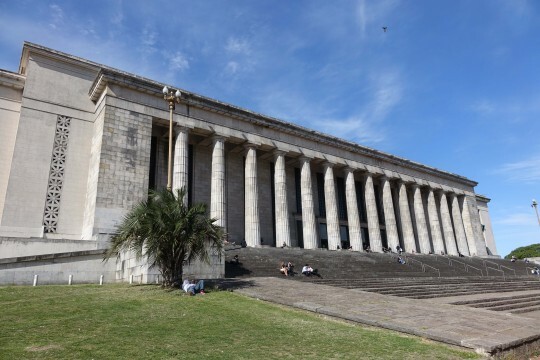 Access is through steps inside, and bodies are usually buried on two levels – one about 5 metres deep and one around 2.5 metres below the surface. If you looked in some of the structures you could see the stairs down to where the coffins are kept. 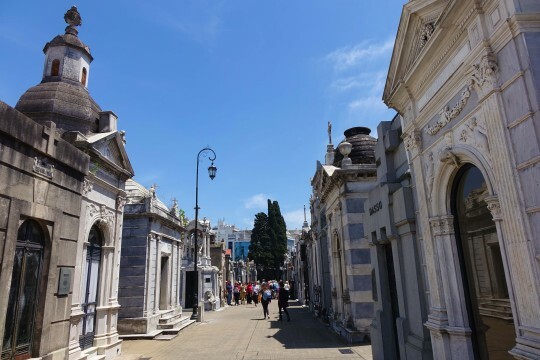 Although the cemetery’s full now (and the main one for Buenos Aires is about 25 minutes away from the city centre), families do occasionally sell plots and cremate any remains. Depending on their location in the cemetery, plots can go for $US 45,000. Apparently it’s all done by word of mouth – and the cemetery caretakers know everything. It was absolutely scorching walking around, and by the time the tour was over (I think it took about two hours) I was absolutely frazzled and feeling very sunburnt, even though I’d put sunscreen on. 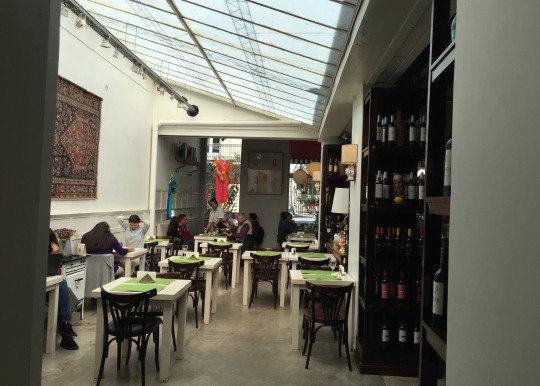 Inside, it was like a deli selling some food, and a cafe. I had the seat on the right, which I very quickly learnt wasn’t the coolest spot as the sun came beating through the glass above me. It was massive! 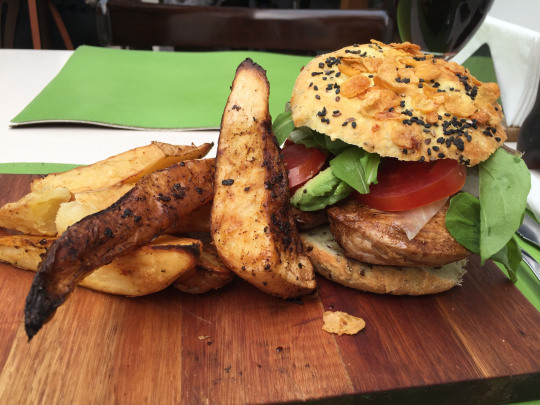 I couldn’t finish it – and it was yet another burger! 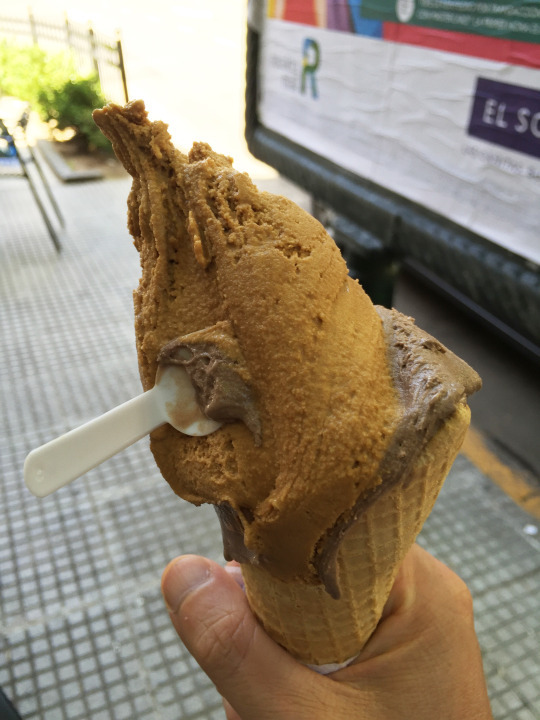 Walking back along the street to the centre of Palermo, I saw an ice cream shop and couldn’t resist. 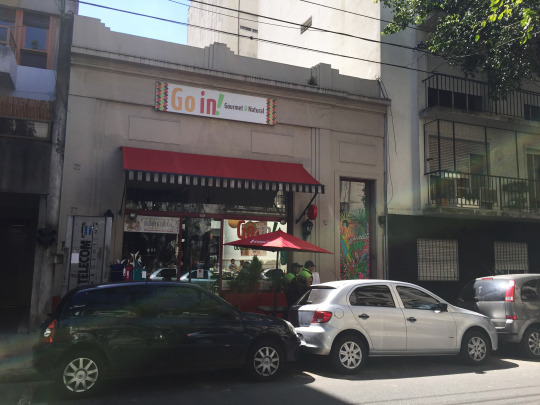 Freddos are all over Buenos Aires, and they make delicious ice cream. I had a chocolate and dulche de leche combo, but it started to melt before I’d even left the shop and was soon running down my arm, so it was a bit of a race to eat it. 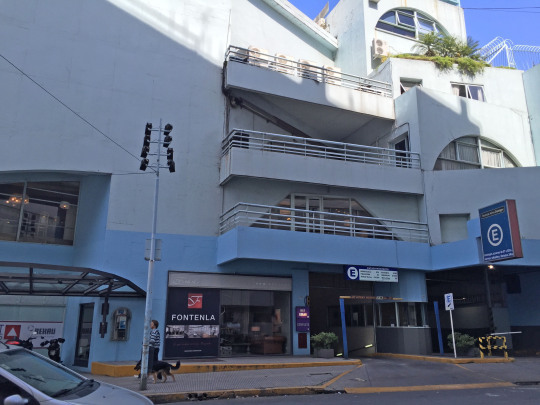 Walking around, I was kind of following a neighbourhood walk map in my copy of Lonely Planet – and headed to Buenos Aires Design, which is like a mall for house stuff. I thought I might pick up some cool thing for my flat as a souvenir. It didn’t look promising from the outside (although I think I went in the back). It was kind of meh, very high end kitchen shops and stuff so I didn’t get anything in there. 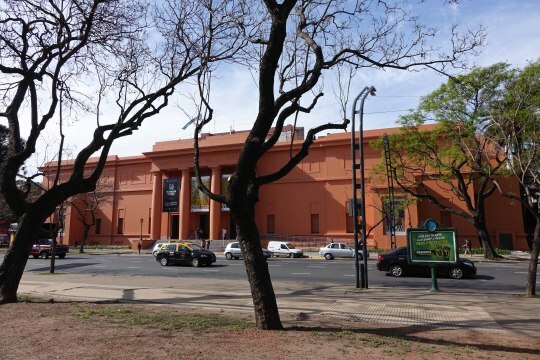 Next on my walk was the Museo Nacional de Bellas Artes – an art gallery for a bit of culture. 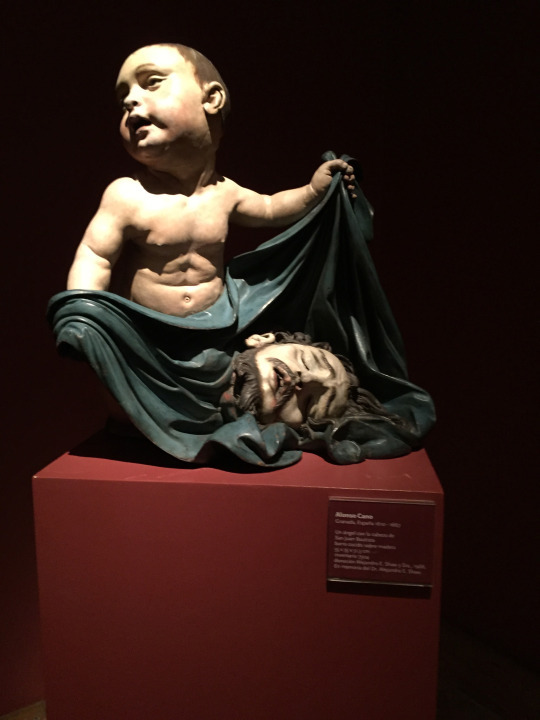 It has works from all over the world, including by Monet, Renoir and Toulouse Lautrec. I didn’t spent too much time in it to be honest, as there didn’t seem to be any English information, but it was a way to escape the heat outside and I did see this grim sculpture. 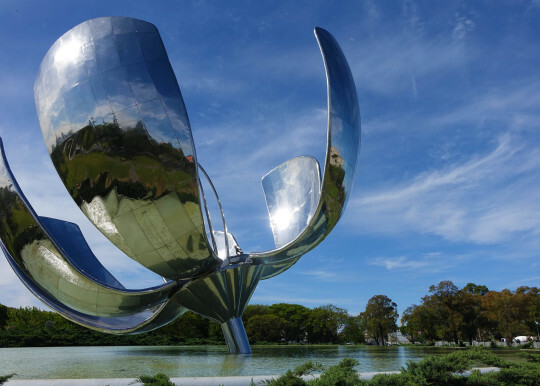 A five minute walk away was Floralis Genérica, a cool sculpture which opens up during the day. It was enormous. A quick walk past the School of Law…. 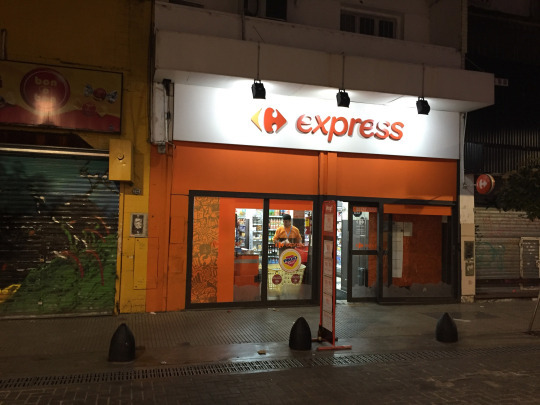 And I was back by the cemetery, after trying to enter the Centro Cultural Recoleta (mentioned in Lonely Planet) but finding out it was closed until 7pm. 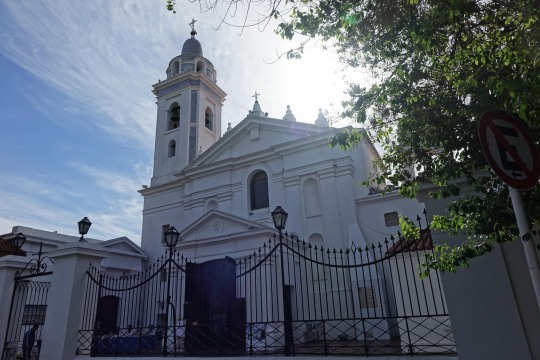 I was outside the church which started Recoleta Cemetery (and is right beside it). By now, I was absolutely knackered. I’m not sure whether it was the sun, or the effects of my bike ride the day before, but all I wanted to do was go to bed. It had been a nice day wandering around, but I felt like I’d walked miles, and apart from the cemetery, I felt I really hadn’t seen that much. A quick hop to Carrefour to grab a sandwich for dinner (no energy to go out!) and I was back in the hotel watching the rest of the DVD I’d borrowed before I nodded off. The next day would be my last in a city which I’d really come to enjoy.